Chicago Blackhawks winger Patrick Kane is the last-place team's lone All-Star representative, and it's unlikely he returns home from this weekend's festivities in San Jose with any hardware based on odds from Caesars Entertainment in Las Vegas posted Tuesday. 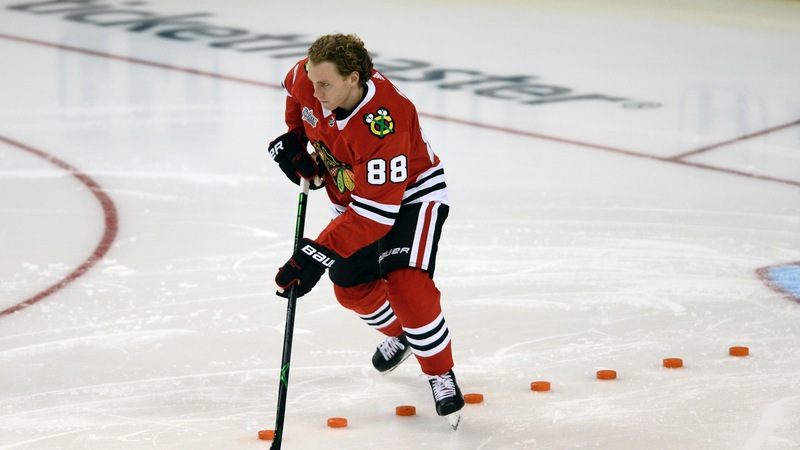 Chicago Blackhawks winger Patrick Kane is the last-place team's lone All-Star Game representative, and it's unlikely he returns home from this weekend's festivities in San Jose with any hardware based on odds from Caesars Entertainment in Las Vegas posted Tuesday. Kane's Central Division team is 4/1 to win the tournament, according to Jeff Davis of Caesars. ## 2019 NHL All-Star Game odds <a href="https://twitter.com/The_Junkyard/status/1087757926696071168" class="embedly-card" data-card-width="100%" data-card-controls="0">Embedded content: https://twitter.com/The_Junkyard/status/1087757926696071168</a> In case you're unfamiliar with the seemingly ever-changing format of the NHL's ASG, there are four 11-man teams (one from each division), with the Eastern Conference divisions -- the Atlantic and Metropolitan -- playing each other in one 3-on-3 game, and the Western Conference's -- the Central and Pacific -- playing in another. Two teams advance to then crown a winner. All 31 teams must be represented, Kane being that for the Blackhawks, who enter their Tuesday night game against the Islanders tied with the Devils, Senators and Red Wings for the fewest points in the league. __MORE:__ [The Islanders are Cup longshots despite being NHL's hottest team](https://www.betchicago.com/blackhawks-islanders-betting-stanley-cup-odds) The Central Division is at an inherent disadvantage because all the other divisions have eight teams, while it only has seven. The Central is 0-3 under the current format of the All-Star Game. Once the expansion team in Seattle begins play ([expected to be the 2021-22 season](https://www.nytimes.com/2018/12/04/sports/seattle-nhl-expansion-team.html)), the Coyotes will move to the Central so each has eight. The games begin at 7 p.m. CT Saturday, broadcasted stateside on NBC, while the skills challenges will begin at 8 p.m. CT Friday on NBCSN. The 30-year-old Kane will be playing in his eighth All-Star Game, but this is the second straight year he is the Blackhawks' lone representative. Kane, a three-time playoff MVP, one-time league MVP and scoring champion, has never won ASG MVP, but two Chicago players have -- Eric Daze in 2002 and Patrick Sharp in '11. Kane has won two skills competitions: the 2012 breakaway challenge and 2015 shooting accuracy. <a href="https://www.youtube.com/watch?v=Q8LEJ_I7_7o" class="embedly-card" data-card-width="100%" data-card-controls="0">Embedded content: https://www.youtube.com/watch?v=Q8LEJ_I7_7o</a> Here are the rosters for each team, [courtesy of NHL.com](https://www.nhl.com/news/2019-nhl-all-star-game-rosters-announced/c-303482748). __Atlantic Division (All-Star appearance)__ F Jack Eichel, BUF (2nd) F Nikita Kucherov, TBL (3rd) F Auston Matthews, TOR (3rd)* F Jeff Skinner, BUF (2nd)^ F David Pastrnak, BOS (1st) F Steven Stamkos, TBL (6th) F John Tavares, TOR (6th) D Thomas Chabot, OTT (1st) D Keith Yandle, FLA (3rd) G Jimmy Howard, DET (2nd) G Andrei Vasilevskiy, TBL (2nd) __Metropolitan Division__ F Sebastian Aho, CAR (1st) F Cam Atkinson, CBJ (2nd) F Mathew Barzal, NYI (1st) F Sidney Crosby, PIT (4th) F Claude Giroux, PHI (6th) F Kyle Palmieri, NJD (1st) D John Carlson, WSH (1st) D Seth Jones, CBJ (2nd) D Kris Letang, PIT (5th)^ G Braden Holtby, WSH (4th) G Henrik Lundqvist, NYR (5th) __Central Division__ F Patrick Kane, CHI (8th) F Nathan MacKinnon, COL (3rd)* F Ryan O'Reilly, STL (2nd) F Mikko Rantanen, COL (1st) F Mark Scheifele, WPG (1st) F Blake Wheeler, WPG (2nd) F Gabriel Landeskog, COL (1st)^ D Miro Heiskanen, DAL (1st) D Roman Josi, NSH (2nd) G Devan Dubnyk, MIN (3rd) G Pekka Rinne, NSH (3rd) __Pacific Division__ F Johnny Gaudreau, CGY (5th) F Clayton Keller, ARI (1st) F Connor McDavid, EDM (3rd)* F Joe Pavelski, SJS (3rd) F Elias Pettersson, VAN (1st) F Leon Draisaitl, EDM (1st)^ D Brent Burns, SJS (6th) D Drew Doughty, LAK (5th) D Erik Karlsson, SJS (6th) G Marc-Andre Fleury, VGK (4th) G John Gibson, ANA (2nd) *Fan-elected captain ^Last Men In winner __PLAY:__ Our free [Chicago NHL Puck Drop contest](https://betchicago.chalkline.com/games/chicago-nhl-puck-drop). Correctly pick the exact score of Tuesday's Islanders-Blackhawks game to win a BetChicago prize pack.